A stone can be decorated by sandblasting. Sandblasting uses sand carried by a blast of air or steam at a high speed. You can clean metal, etch glass or decorate and clean stones by sandblasting. Sandblasting has been used to revive or clean old stone surfaces like a fireplace surround or mantle made of stone or an exterior surface of the house made with stone material. Choose a stone. Make sure that the stone you choose has no cracks so that the stone does not break when sandblasted. Choose a flat stone as opposed to a stone with too much bumps so that you get a smooth edge. Make sure to place the stone on a stable surface. You may need to anchor the stone so it doesn't move if it is a small one. For bigger stones, put it on the ground. Choose a design. 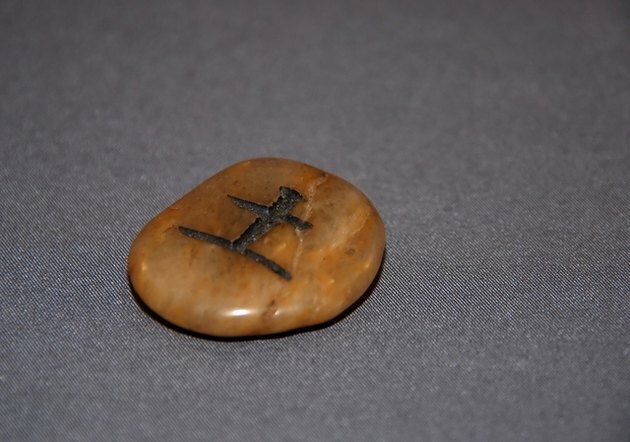 Think of a motif or design, or even words to engrave on the stone. A two-dimensional design is an ideal choice for sandblasting. Draw or trace your design on lucite paper or directly on the rubber stencil if you feel comfortable doing it directly without too much mistakes. The sandblasting rubber used as a stencil is made of silicon. This comes as a self adhesive stencil for regular and strong sandblast applications (3mm-5mm thickness). Glue the rubber stencil on the surface of the stone. You can also peel off the adhesive, attach the stencil to the piece to be sandblasted and remove the cover sheet. Use a handy sandblaster to engrave the design. A small or handy sandblaster is ideal for small projects such as this. Wear eye protection and face mask to protect your eyes and so that you do not inhale the sand. Fill up the cup that came with your handy sandblaster then hook your sandblaster to the air supply then start blasting away. The abrasive is then sucked back into a little bag, most of the sand can still be reused for future projects. Apply paint to the design. Choose lighter color for darker stones so that it shows, likewise, choose darker colors for lighter colored stones. Allow paint to dry then, clean up the surface for a good clean finish. Inspect the stone for any cracks or damage. Mark the areas with cracks, even with the smallest ones. This way, you can avoid the cracks when sandblasting with a powerful sandblaster. Clear the surrounding areas. If you are sandblasting an interior wall made of stone or a fireplace surround made of stone that is stationary or cannot be brought outdoors, you may need to put away your furnishings, pictures or anything that may be damaged or may get dirty during the sandblasting process. Hang a plastic vertically from the ceiling. Position these plastic covers so that it covers the areas where you will be working. The plastic will prevent the dust from spreading inside the house. Place newspapers, floor cloth or construction papers on top of the floors and exposed nearby walls to protect them from being dirty or damaged during the sandblasting process. Wear a face mask, eye goggles and work gloves for protection. Use a portable sandblaster that you can buy or rent from a home improvement store. Put abrasive into your sandblaster canister by using the funnel that comes with the unit. The common types of abrasives to use are aluminum oxide, white aluminum oxide and silicone carbide grit. These abrasives are strong enough to penetrate into hard surfaces and remove any old paint or rust. They can also be reused several times for future projects. Turn on the pressure valve. Adjust the air pressure between 65 to 125 PSI. (Read the safety instructions that come with your unit, not all units are the same). Point the sandblaster directly towards the stone. Adjust the hose nozzles depending on the angle. Use a horizontal motion, going from one end to the other. Make sure to watch out for the cracks so that you avoid them. You can go back and mildly sandblast the areas with cracks using a mini sandblaster using lower pressure. Depending on the capacity of your sandblaster you may need to refill every 30 minutes. A 90 to 110 lb. abrasive capacity and a 35 to 50 minute blasting time or smaller and with 50 to 65 lb. abrasive capacity and a 20 to 30 minute blasting time. Dust off the surface of the stone and inspect the finish. If it is smooth enough, you are done! The same process works for the exterior walls. You would need to cover the exterior glass windows and doors that are close to the walls to be sandblasted so that they are protected. You can use construction paper, floor cloth or heavy plastics for protection. You can also cover the plants nearby if there are any. Apply paint or any finishing material of choice to complete your project.